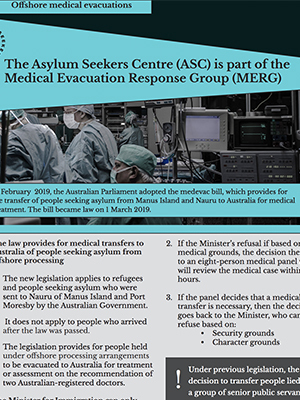 In February 2019, the Australian Parliament adopted the medevac bill, which provides for the transfer of people seeking asylum from Manus Island and Nauru to Australia for medical treatment. The bill became law on 1 March 2019. The new legislation applies to refugees and people seeking asylum who were sent to Nauru of Manus Island and Port Moresby by the Australian Government. It does not apply to people who arrived after the law was passed. The legislation provides for people held under offshore processing arrangements to be evacuated to Australia for treatment or assessment on the recommendation of two Australian-registered doctors. If the Minister’s refusal if based on medical grounds, the decision then goes to an eight-person medical panel who will review the medical case within 72 hours. Under previous legislation, the decision to transfer people lied with a group of senior public servants. The Medevac bill places the decision in the hands of medical professionals. The Minister can only oppose a transfer on security or character grounds. In the absence of such grounds, the transfer must be permitted. 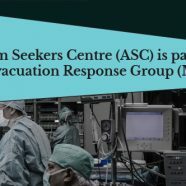 The Asylum Seekers Centre (ASC) is part of the Medical Evacuation Response Group (MERG), also called the Medevac Group. Through MERG, key specialist refugee support organisations across the country have partnered to oversee and ensure the timely and orderly assessment of applications for medical transfers under the new legislation. The group comprises doctors, lawyers, counsellors and caseworkers who, together, will work with people on Manus and Nauru. Their aim is to ensure people are informed about the process and supported in their application to be transferred under the new legislation. The Medevac Group is currently setting up its referral team, who will be your main point of contact. As soon as it is in place, contact details will be available on the Group’s website. People seeking to apply for a medical evacuation should contact the MERG referral team. People who are already on a waitlist for a lawyer or a caseworker will be contacted by the referral team. A triage worker will then contact them with an interpreter and start the process. More information about the full process can be found on the MERG website. The Medevac Group only assists with applications for medical evacuations to the Minister. The Group does not make the decision on whether or not people will be transferred for medical treatment or assessment.